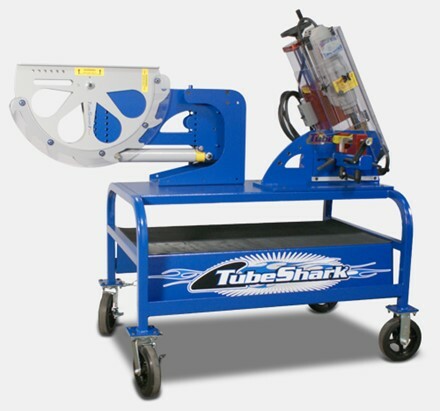 The Shark Pool works great in the shop or on the road...anywhere you need the complete TubeShark® system. Get the most from these precision machines, while keeping die sets, tools and accessories organized. CONVENIENT - Walk-around design for easy access to all sides of both machines. SOLID - Heavy-duty steel bench supports both machines, all dies, accessories and tools. PORTABLE - Locking wheels provide quick-and-easy portability and rock-solid stability. COMPLETE - Shark Pool includes Bench Mount TubeShark® Bender and Notcher with rolling bench. Available options include: Die Sets, ITS Mandrel System, Digital Protractor and more.